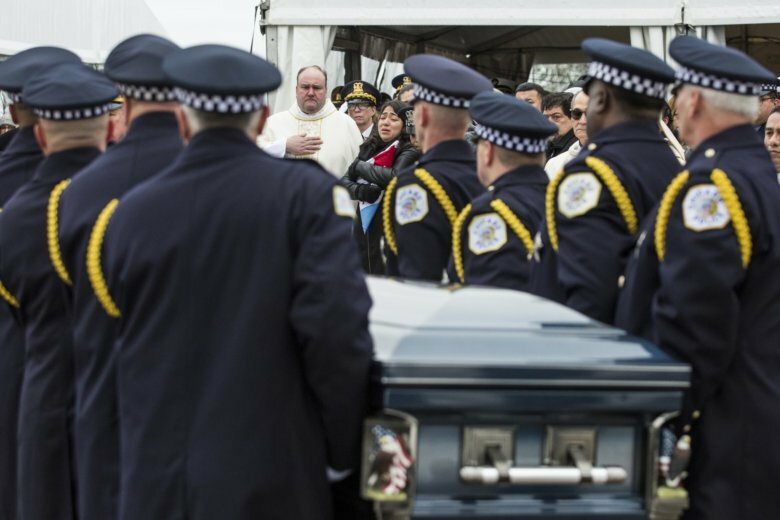 DES PLAINES, Ill. (AP) — A Chicago police officer who was killed in a shoot-out after he chased a gunman into a hospital last week has been remembered as a “guardian” who was devoted to helping others long before he joined the police force. Jimenez was doing errands Nov. 19 when he and his partner followed the police cars that were racing to the hospital after a report that a gunman had shot someone in the parking lot. When they arrived, they jumped out of their squad car and chased Juan Lopez into the hospital moments after Lopez fatally shot Dr. Tamara O’Neal, who had recently called off their engagement. Inside the hospital, Lopez, fatally shot Dayna Less, a 24-year-old first-year pharmacy resident, before he was shot in the abdomen and turned his gun on himself. Also Monday, mourners gathered at a church in a south suburb for a funeral to remember Less. Rev. Milos Vesin told mourners at St. Archangel Michael Church why the shooting has been so hard for so many to deal with.